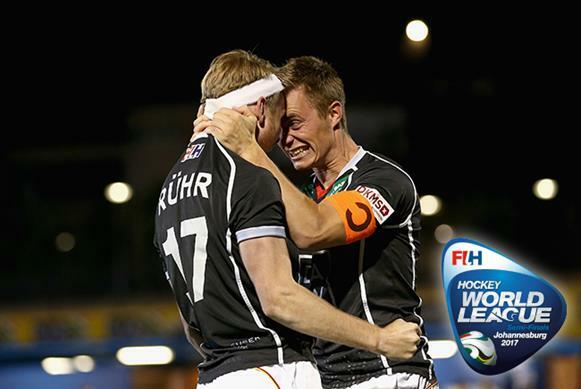 Johannesburg, South Africa: The men’s final at the Hockey World League Semi-Final will be contested between Germany and Belgium following another dramatic day of action at the University of the Witwatersrand. It was also a hugely significant day for New Zealand and Ireland, who claimed wins to take their places in the 5-6 classification match, the winner of which will be guaranteed a place at the Odisha Hockey Men’s World Cup Bhubaneswar 2018. Germany (FIH Hero World Ranking: 3) were the first team to reach Sunday’s showpiece final, fighting back from a goal down against Spain (WR: 10) to tie the match before winning a tense sudden-death shoot-out. Die Honamas were made to work extremely hard to replicate the achievement of Germany’s women in reaching their event final, with Ricardo Sanchez putting the Spaniards ahead at the end of the first quarter. Germany’s equaliser did not arrive until five minutes from the end when Ferdinand Weinke smashed home from a tight angle to force the shoot-out. The two sides were locked together at 2-2 after ten shoot-out attempts, with Sergi Enrique and Mats Grambusch making it 3-3 before the telling moment arrived. Spain’s Enrique Gonzalez – a young player who has had an outstanding tournament – failed to convert, with Christopher Rühr making no mistake to put his team into the final. Germany’s opponents in the final will be European rivals Belgium, a team the Germans defeated in the pool phase. However, the Red Lions will be looking to avenge that result following their hard-earned 2-1 victory over Australia’s Kookaburras. Belgium netted either side of half time through Cedric Charlier and Amaury Keusters before Jeremy Hayward slammed home an Australian penalty corner at the end of the third quarter. Australia’s Kiran Arunasalam had a goal ruled out in the final minute as Belgium clung on to set up an all-European event final. In the 5-8 matches, Egypt (WR: 19) gave New Zealand (WR: 8) a run for their money before eventually being beaten 2-0. The Egyptians proved difficult to break down but eventually the Black Sticks got the breakthrough just after half time thanks to a high quality penalty corner routine expertly converted by Nick Haig. Kane Russell added a second ten minutes from the end with a penalty corner routine almost identical to the first, putting New Zealand into the 5-6 classification where that direct ticket to the Odisha Hockey Men’s World Cup Bhubaneswar 2018 is on the table. New Zealand’s opponents in that all important World Cup play-off match will be Ireland (WR: 9), who were taken to a shoot-out by France (WR: 17) before two times FIH Hockey Stars Goalkeeper of the Year David Harte made two important saves to see his side safely through. Hugo Genestet gave France the lead just five minutes into the match, an advantage that they held until late in the third quarter when Shane O’Donoghue netted a penalty stroke. In the shoot-out, goalkeeper Harte denied Guillaume Deront and Hugo Genestet before Chris Cargo scored the winner to keep his teams hopes of direct World Cup qualification alive. Earlier in the day, Austin Smith scored twice to help hosts South Africa (WR: 15) finish their competition on a high, beating Japan (WR: 16) 4-2 to take ninth place on the final standings. On Saturday 22nd July, the 5-8 classification positions in both the women’s and men’s competitions will be finalised. At 11:15 South Africa Standard Time (UTC +2), the women of India and Ireland will meet in the 7-8 classification match, with Japan and South Africa facing off at 13:30 in the women’s 5-6 contest. The attention then switches to the men’s 5-8 classification games, with Egypt playing France for seventh at 15:45, before New Zealand and Ireland take to the field at 18:00 for the battle for fifth place and the subsequent World Cup qualification ticket that comes with it.